Your one stop shop for fast and reliable Minecraft server hosting. Our plans are listed below. Here is a list of features you get with your Minecraft server hosting package. Your game server is installed within minutes of purchase. You can also reinstall it within minutes via control panel if issues occur. Your service is always protected from DDOS attacks from nefarious actors. Never face a downtime due to this again. Experience the lowest latency possible while gaming on our servers. Important for multiplayer games. Need help setting up a script or a plugin on your server? We would be glad to help assist you with getting it running. Never experience a server slowdown or lag again. We use top quality Intel CPU's to deliver fast performance. TCAdmin is a easy to use control panel to manage your server and see game statistics. 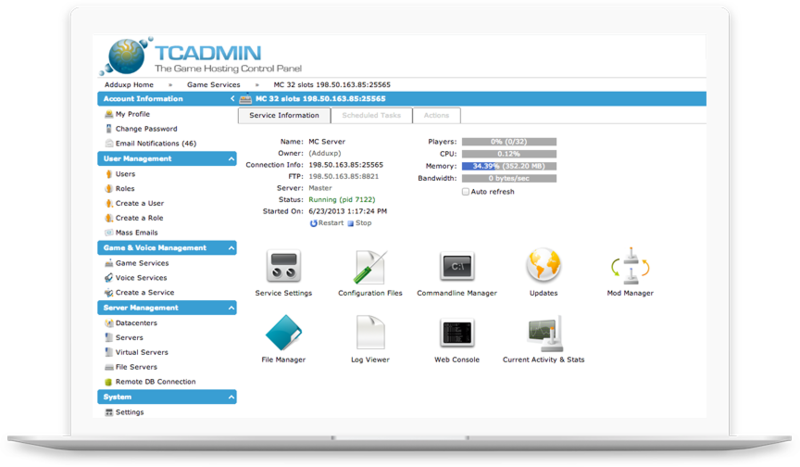 Manage your game servers all in one place with this easy to use TCAdmin Control Panel. Start/Stop and control your game server. Edit game server configuration files with ease. Colorhost is a hosting company that host great gameservers. They have a good customer support and a nice panel. Looking for a different game? Check these out!